Want to get the kids off the sofa, away from the computer or TV screen and get them out into the fresh air and maybe enjoy running about in the sunshine like you did for hours on end when you were a child? Me too! Maybe get them to look at nature or their surroundings in more of a creative way? I find that teaching them something fun as they play is a great way to learn. Here is an idea to help. 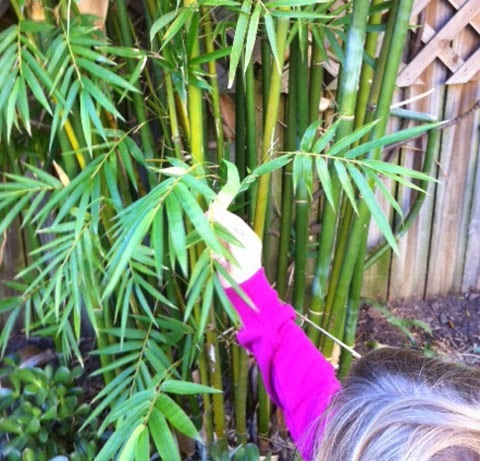 A treasure hunt is great for all ages and popular with boys and girls alike. I get mine to help the little ones with reading the clues and take turns. They get a chance to run about, work in a team, and you can tweak the clues depending on their age and ability. I have done treasure hunt parties on bikes where the two teams ultimately had to find the party venue, treasure hunt spy parties , and I always do one at Christmas to find the ‘ big presents’ . Kids just LOVE them. And of course I must enjoy doing them too! This Colour Treasure Hunt will be a bit different. This is a game for up to 7 kids. One colour each. 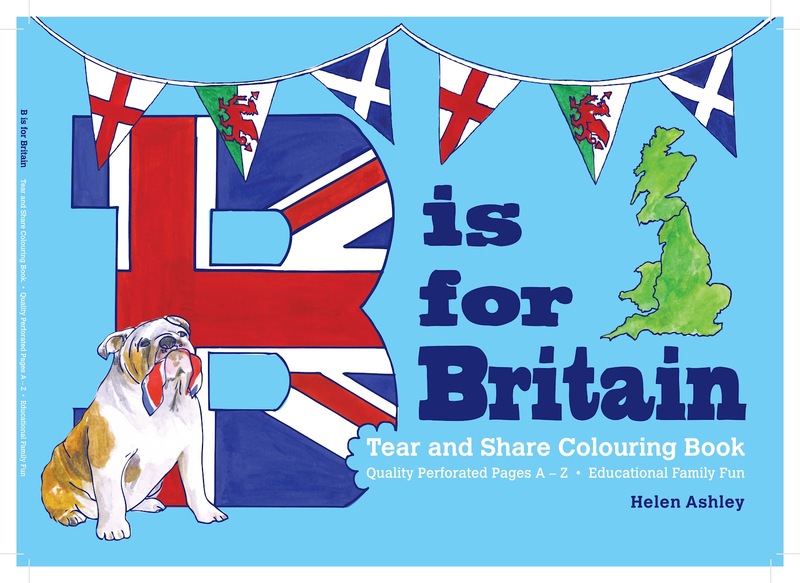 If you have less than 7, just get them to collect a couple of colours each. It consists of 3 game parts. You can just do one or all 3 parts if you want. Depends on your time and venue. Part 1 scavenger hunt. 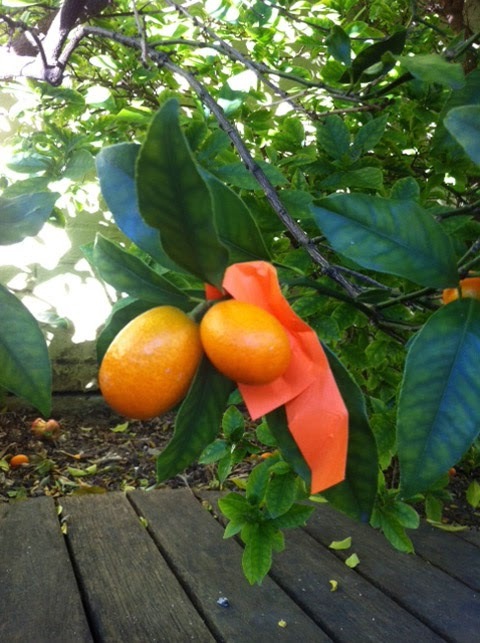 Each child collects their designated colour treasure, hidden in the garden or park. Make sure they know how many pieces you have hidden for them before they start. Part 2 treasure hunt with clues and a puzzle. Once colour treasure has been collected, each child has to answer their particular colour clue. Their reward is a piece of rainbow puzzle which when they have pieced them all together then reveals the last big clue to lead them to the pot of gold at the end of the rainbow. You could use a pot of chocolate money or even a real gold $2 coin each. Or maybe it might be a pot of cookies or some kind of other treat. Up to you. Part 3 eco colour hunt clear up. Each child collects as many pieces of coloured rubbish as possible. If you are in a local park, this is a great way of them tidying up after a picnic or a play. The orange collector collects everything orange, the blue collector everything blue….etc etc. This obviously teaches them to respect their natural surroundings and to be responsible little colour hunters. Cut up rainbow into colour strips once you have written the big final clue on its reverse. · A picture of a rainbow at least A4 size. This could just be a print off image from the internet or if you are feeling really creative you could get the kids to paint or colour one. It should show clearly the 7 colours of the rainbow. RED. ORANGE. YELLOW. GREEN .BLUE. INDIGO. VIOLET. .Scissors for cutting up this rainbow picture. 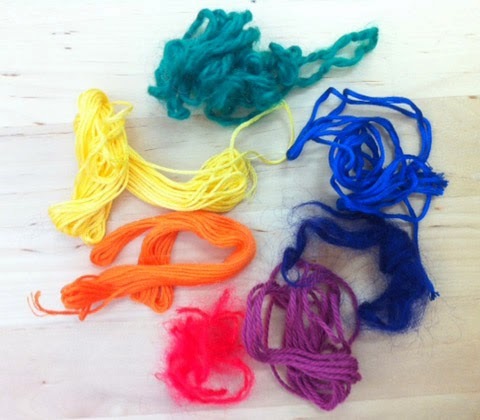 · Coloured wool, paper or something easily hidden in the colours of the rainbow. Coloured wool scraps, craft paper or even something like monopoly money would do. 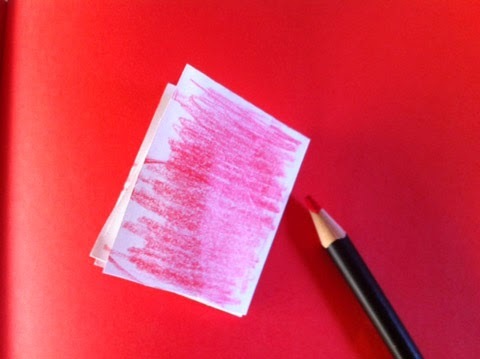 · Plain paper for clues and coloured pencils to determine a colour marking so each child knows what clue is specifically for them. · Pen for writing clues. · Sticky tape for sticking the rainbow picture puzzle back together when each child has solved their colour clue. · A bag or something for collecting rainbow treasure for each child. 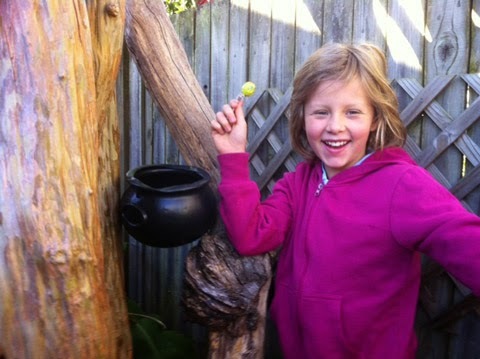 · Treasure for the pot at the end of the rainbow.Gold chocolate coins or some shiny new dollar coins. 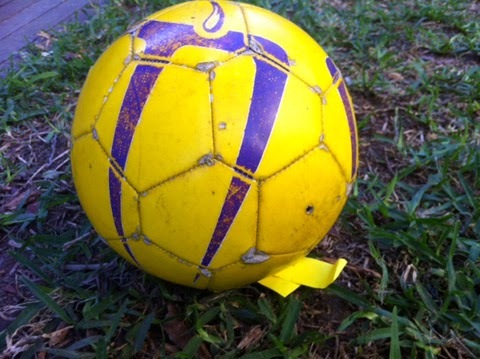 Anything you think your kids will see as treasure. A pot to put them in. · Your pot of gold at the end of the rainbow. Could be 15 mins. Could be an hour. Depends on your clues, numbers of clues and your level of enthusiasm. My tip….. the more effort you put in, the better the hunt, the longer they will be running about , and the more memorable and enjoyable for all. A good investment ! Depends on number of clues and number of kids. Anywhere outside is best but if weather is really inclement, you could I suppose do it inside. Have to make sure the kids stay in a small room while you place the treasure about the place. A park or a good size back yard. Preferably somewhere with a few colours and options for hiding clues. Sort out your coloured treasure into various colour piles. Make sure you have at least 7 pieces per colour to make the hunt last a little while. Cut the paper or coloured wool into even pieces. 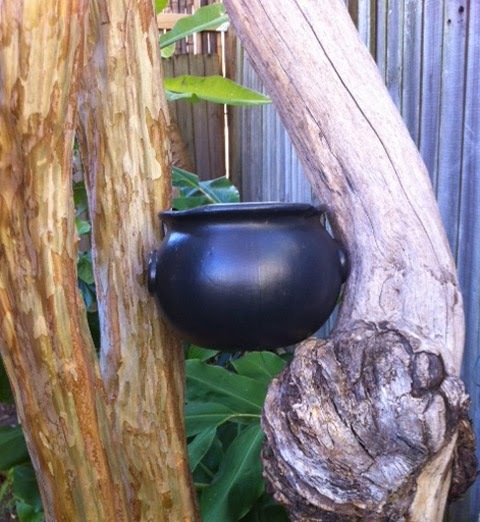 Find a pot for your rainbow treasure. I am using an old Halloween trick or treat collecting tub. Fill with your treat or treasure. See pic. 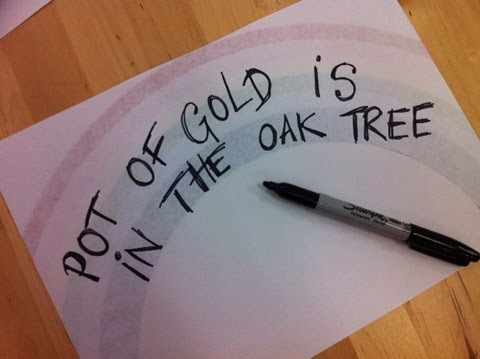 Write your final clue in large writing on the reverse side of your rainbow picture and then cut along the colour lines of your rainbow print outs. Put pieces to one side somewhere safe and out of the wind. Make sure the kids are distracted while you set up. Get your partner to take them off for a wander or keep them busy on the play equipment maybe? If they sneak a peak its all over red rover! You could use coloured thread instead of paper . Hide your colour clues around the garden \ park. Space things out and try and camouflage each colour with its surroundings. Think about the height of your treasure hunters. You might want to tie some wool around branches. Partially hide something. Use your imagination. Violet colour was well camouflaged! You could make them more complex for older children for eg What colour comes after red in the traffic light sequence? Each clue should be based on a colour, their meaning, or it could even be something really personal or particular to your family. What colour eyes does dad have? 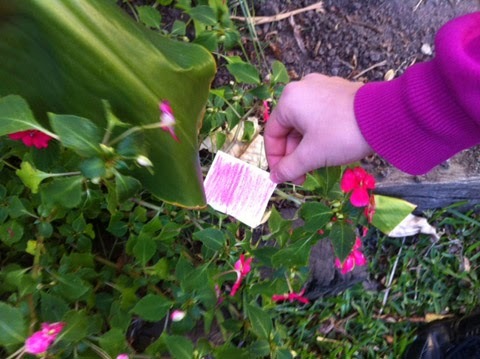 You hide these paper clues along with the colour treasure in the garden. Each collector knows which is his clue by a coloured spot or coloured pencil marking on the outside of it. See picture. Sit all the kids down. Tell them the rules about waiting for the little ones. If you are in a public park make sure the kids know where the parameters of the hunt are. Don’t want them to go off wandering. Share out the colours. Who collects blue, who collects green. Tell them what to expect. You need to find 10 pieces of ….. and a paper scroll clue. Kids like to know the rules up front. When they have collected all 10 and their colour clue, tell them to come back to base and you will reward them when they have solved their wordy clue. Maybe park yourself on a picnic rug in the centre of the hunt with a well earned cuppa. Half the fun is watching them discover it all. #5: And their off……. Sit back and enjoy their adventure….. there really is a pot of gold at the end of the rainbow! Finally do part 3 of the Colour Treasure Hunt. Eco treasure hunt. Get them to collect everything they can see that shouldn’t be in the park \ or your backyard. Lollie wrapper, a yellow straw, a blue bit of paper, a bit of lost rainbow. The winner with the most colour treasure in their colour maybe gets an extra treat. Choice of dinner, an extra gold coin….. whatever you feel rewards them best. Choose your venue with a bit of care. The more variation in surrounding colours and environment, the better the hunt will be and the more fun it will be for all. 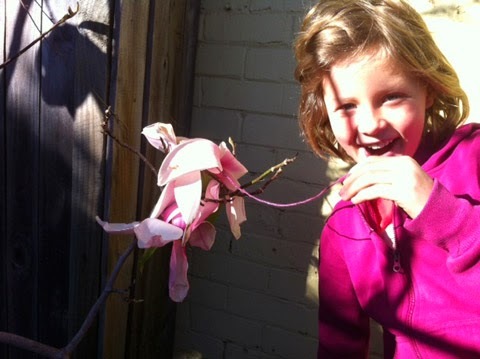 It’s a great tool for teaching kids about colour, nature and for them to look a bit closer at their surroundings. I love this photo. It really sums up my next colour, green. Its peaceful, restful, uplifting. It signifies balance, honesty, harmony and a refreshing sense of well being. Green is the colour we associate with words like durability and renewal and fertility. Its the colour of self respect and unconditional love. Green is the most restful colour on ones eyes. Its the world's most favourite colour after blue. In colour therapy its the colour used to relax a mind. If the colour wheel was a PH scale it would be bang in the middle. Green really stands for nature. If you think about it almost all of nature has some element of green in it. Politically it is always associated with environmental issues which is logical. In Asia the green stone of Jade is sacred. In Ireland , St Patrick's day is always associated with the colour green. Its the colour of Christmas ( coupled with its opposite red of course) and the ' go ' colour for traffic lights . In business if you get the 'green light ' for an idea or project its only positive go go go!! 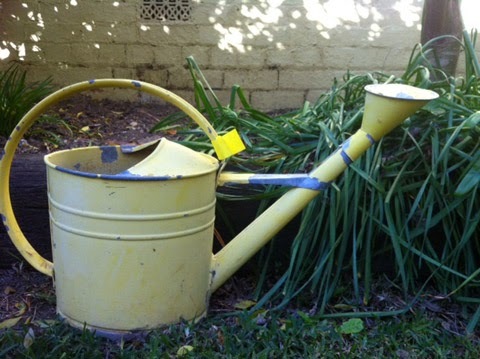 If you have a green thumb in the garden, you are a 'natural' gardener. We talk of the American dollar being the ' green back', ' greener pastures' being richer than what we have. Deep greens indicate old money, racing green, speed with style whereas olive green is the ultimate colour of peace. However green does get some negative press too. How about green with jealousy ' the green eyed monster' as Shakespeare referred to this deadly sin. It is also a colour we can associate with sickness. We talk about someone turning green when they are about to vomit. But maybe that is more Chartreuse yellowy greens in the palette as eating green vegetables is always a healthy option! Whether you like green or not, it has to be considered the oldest colour of life really. Its our natural back drop and makes you feel calmer even if you don't realise it does. Next time you are at the park or in the garden with the kids , get them to spot how many different kinds of greens they can see. You would be amazed and I think its always good for them to appreciate the colours of their surroundings. Easter is one of the best time of year to get creative with the kids and have a bit of fun with colour. We always do an Easter egg hunt , sometimes with written clues and even using map coordinates now they are getting older. One of the favourite traditions in our family is egg rolling. We first hard boil an egg each. Add some vinegar to the water and they seem to harden even more . Bit like baking conkers ready for battle! Then once they are left to cool, you can start the fun decorating them. Using wax crayons ( or candles if you don't have any) you can draw on them. You can use inks ( or food colouring ) for bright colours. Glue and beads, string or paper for the more deconstructive creators. You can add your own style and preferably your initial to make them different. Best dressed egg gets a small prize in our house but then on Easter Sunday we meet up with friends and do our traditional egg rolling competition. A lot of fun and if you have kids that are older than each other , this is a family tradition that spans the age difference between children quite well. You set the course ( on a hill obviously), rolling the eggs one at a time down it. The winner of each round is the egg that rolls the furthest that remains intact. You keep taking turns until the ultimate winner gets the first prize. The Crows and Ibis like their Easter treat left behind and unless you have decorated your egg with something really unbiodegradable , you can leave them to feast while you go for a dip to work off your chocolate fest. Red is for Love. Happy Valentine's Day! So Valentines Day has come around again! 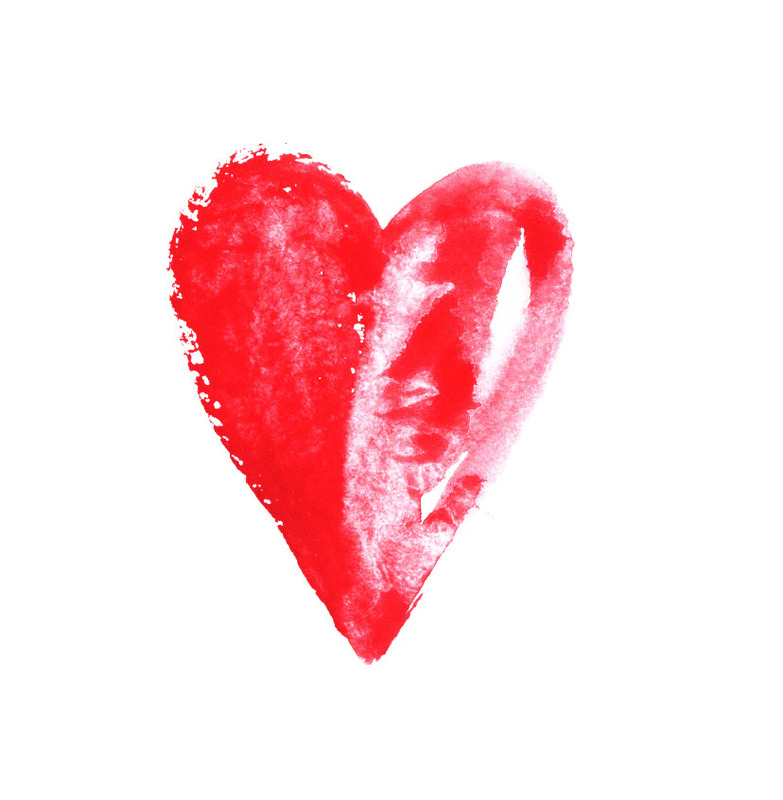 Why do we associate the colour red with love? Well red, pink and those hot colours make our heart skip a beat. Just like love. Red is the end of the colour spectrum that make us take notice, it stands for danger, hot taps, red traffic lights, fast sports cars, warning signs, fire fire! Next time you are at the supermarket just take a look at how much packaging is in red. Buy me , buy me now!! The Chinese culture consider red ( and gold ) very good luck. I have designed many a bedlinen set based on this colour combination , traditionally given to newly weds. Think of expressions like ' in the pink', seeing things through 'rose tinted spectacles', it's a very positive colour and if you are feeling physically low, red lifts the soul, cheers you up. The very basic feng shui rule on red is to put it in your relationship corner ( top right ), so think about growing something red or pink in your top right corner of your garden, put something red or pink on the top right corner of your desk, bedroom........ See if it makes a difference to your lovelife or sense of wellbeing. I know I was amazed to see a deep pink colour painted walls on the delivery floor of Royal Womens Hospital in Randwick but the sense of positivity , love and warmth when you step out of the lift is fantastic. Someone knew what they were doing when they chose that! Must have been a mum that knew a thing about colour theory! Anyway Happy Valentine's Day whatever colour you are wearing! So as Australia Day fast approaches, it would be good to think that the public knows what the Australian Made official logo means to a small business like ColourMeArt. I always try and encourage creative friends and colleagues to get the Australian Made logo on their products whenever possible. It is a great selling point, when virtually nothing is truly made in Australia any longer. Any licensee has to sign an affidavit to promise their products are in fact made here. They have to pay an annual license fee based on turnover, and any merchandise like stickers etc is at a cost to that particular business. Most customers and particularly tourists want an Australian made product to take home but whinge about the price in comparison with products made overseas. If the government really wanted to encourage particularly small businesses to keep production here in Australia, they should be handing out stickers, advice and there should be no fee for being a licensee in the first place. 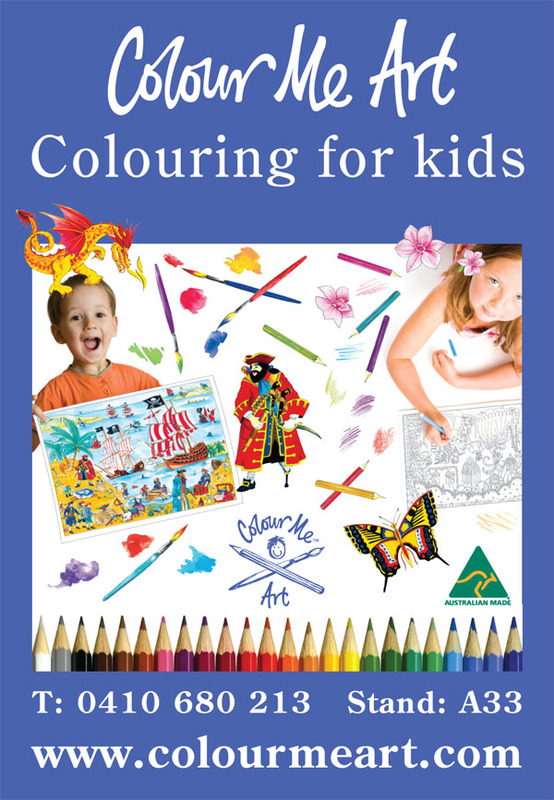 ColourMeArt products are passionately Australian made, and will endeavour to continue to be wherever possible. Hopefully as customers become more discerning in their choices, they will buy more Australian made products.